Eye makeup is one of the important things which should be done correctly to ensure that you look gorgeous. You can choose a simple, light and bright eye shadow for your eyes. Or you can choose dark colors for eye shadow. The main thing is to make sure that the makeup products blend perfectly with the skin so that they don’t make the face look like a mask. Now-a-days Arabic eye look also has gained popularity. Bold and dark colors are used for eye makeup and for lipstick. This look gives a new refreshed look to your image and will make you look bold and gorgeous. To go with Arabic look, deals with choosing dark and loud colors. To get this look is very simple and can be done at home only. For reference you can collect pictures from internet or magazines and then you can decide which colors should be selected. Usually two different colors are selected for eye shadow, but you can also select three colors. There are two options for choosing colors, if you are going with the first option. Either you can select medium and dark colors or you can select medium dark and light colors. Colors chosen should be glittering/shimmering ones. On the upper eyelid but near the lash apply the dark color and when you are moving towards the brows on the middle way select the medium color and apply that. It should look like gradient of two colors. Make sure that both colors blend perfectly with the skin. You can make gradient of up to three colors too by going with dark near lashes then medium in the middle way and light near eyebrows. On the lower lid you should definitely put on dark/medium dark color. To define the eyes properly, you should put on eyeliner properly. Black color is generally chosen and thick lines are made. At the edges some eye liner is spread out. If you going with Arabic eye look then make sure that you wear dark colored lipstick on the lips. Arabic makeup looks good when you do eye makeup and lipstick properly. As the eye shadow is chosen which shimmers, so you should select a normal lipstick i.e. without lip gloss. Red color or dark mauve lipsticks are preferred ones. Arabic makeup will make you look bold with dark colors. If you like dark colors for your makeup then you can go with this makeup style or even if you are the one who always chooses light colors for makeup, then for a change you can select this look. 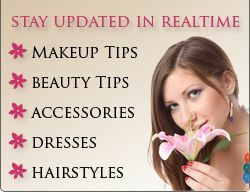 This makeup style will definitely change your look and will make you look beautiful and stunning.